Mr. Abney was found in his chair, his hair thrown back, his face stamped with an expression of rage, fright, and mortal pain. In his left side was a terrible lacerated wound, exposing the heart. In this, another in our series of Objects of the Damned, we poke around in the pigeon-holes of haunted, hoodoo, and damned desks. Our first haunted desk, with its disappearing pens and erasers and unearthly laughter sounds like the subject of a lost M.R. James story. 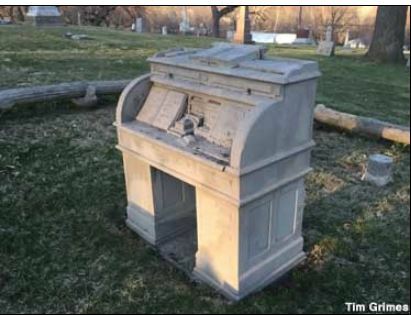 A Chicago clerk a month or two since bought an uncanny-looking desk at auction. It had numerous legs and sloped half a dozen different ways. It was so large it had to be taken to pieces to be gotten into the building. The first day, according to the Chicago Herald, its occupant ran a four-inch sliver into his finger, and that same night the porter, groping about in the dark, fell over the desk and broke his knee-cap. He swore that he heard someone laugh in the room as he picked himself up. Pens, pencils, erasers, etc., placed anywhere upon the desk mysteriously disappeared and were never found again. They nailed a rubber eraser to the desk with a shingle nail. In the morning neither the nail nor the rubber could be seen. The hole in the desk was much larger than the one made by the nail, and penetrated entirely through the board into the drawer beneath. After the clerk sat down he would presently feel the edge push upon his breast, and shortly after he had moved a short distance away from it he would again feel it pressing against him quite closely. He was worried over the matter, lost flesh, became nervous and otherwise showed the influence of his piece of furniture. An employer examined the lumbering affair one afternoon and pronounced it an “old-fashioned institution,” but otherwise all right. Just as he had completed his examination all present were startled by a series of very sharp and very loud cracking sounds, which seemed to issue from the very heart of the haunted desk. The next day two tenants on an upper floor complained that they could not sleep, for the reason of some one in the office slapping sticks upon the floor. The next day both moved away. About this time things seemed to be going wrong in the office. A New York firm failed totally and the failure affected the firm seriously. One partner fell and broke his right arm. The clerk was sick with brain fever, shortages were found in another partner’s private cash account, and collections became dull. Credit seemed to depreciate, and two notes went to protest. At last one morning at 10:30 o’clock, the entire office was thrown into consternation by a peal of unearthly laughter, from the desk. Not half an hour had passed when a messenger arrived from the clerk’s house with the sad news that he had died at 10:30 precisely. They hired three men with sledge hammers to break it up. It took them nearly an hour, and the thing squirmed and groaned like a human being. The cracking sounds remind me of a couple who asked me about an antique cupboard that made similar noises. They feared it was haunted, but I suggested that they might need an exterminator rather than an exorcist–from their description, the noises were probably caused by an infestation of death-watch beetles. On the other hand, poltergeist infestations are also well-known for cracking sound effects, as well as rappings like those from this California desk. A mysterious desk has for some time been an object of great solicitude in the office of the Pacific Coast railway. Several months age Freight Agent Haskins observed a singular rapping and rattling noise in the desk at which he was writing, and endeavored to ascertain the cause. After a careful examination no cause could be found, and work was resumed. At very inopportune times this noise was repeated and a belief was aroused that spirits had taken possession of the desk and it was placed in another room. But even from there it continued its annoyance and it was sent down to the depot without intimation of its tricks. But at the depot it continued its rappings and the clerk to whom it was assigned chose boxes or tables or other desks to write upon rather than confess his fright at the haunted object which was his companion. Luckily a desk was wanted in the depot at Los Alamos. The clerk recommended that the one which had been assigned to him be sent, as he thought he could get along without it, and the officers of the company relieved him of the object of terror. The haunted desk was sent to Los Alamos, bearing a good character and a fresh coat of varnish. It was thought so great a removal would dislodge the troubled and troublesome spirit and give the clerks a rest. But now comes the complaint from Los Alamos of mysterious noises from that same desk. What can be done with it? All are getting frightened. Cannot some medium investigate it and unravel the mystery, or send the desk on to Lompoc, where no spirits are allowed. The Lompoc reference is to the temperate town of Lompoc, whose sober citizens tore down and blew up saloons. “Haunted” desks were bad enough, but the term “hoodoo desk” was reserved for the very worst offenders. I’ve previously looked at motormen’s hoodoos, hoodoo houses, and assorted hoodoos through history. One trouble with stories of Objects of the Damned or hoodooed articles is that their scores of anonymous victims are merely tabulated with a few lurid details about their bad ends if we are lucky. (The Hoodoo Dog of Louisville, with his multiple named victims over the years, was an exception to this hoodoo rule.) These hoodoo desks, which seemed to breed in the bureaucratic warrens of Washington, also provide an unsatisfying tally of troubled Fortean furniture. CLERKS AT WASHINGTON ARE SUPERSTITIOUS. No One Cares to Work at Places That Seem Marked Out for Misfortune– Doorkeeper’s Post an Example. A series of misfortunes involving dismissals, resignations and deaths in the executive departments in Washington often develops what is known as the “hoodoo desk,” says the Washington Post. A desk comes under suspicion after a dismissal of two from the service or after several transfers or resignations, and if there should occur several deaths among the occupants of the desk in the course of a year or two it is designated as the hoodooed desk, and no one in that room cares to do clerical work at it. In a room filled with clerks the hoodoo desk is easily recognized, for it is most generally occupied with the surplus books and general litter of the daily routine work. The desk may remain unoccupied sometimes for months, until some new clerk comes into the room and is assigned to it, provided there is no other vacant desk in the room. Bureau officials generally avoid assigning a new clerk to the hoodoo desk if it can be done. In fact, the desk is apt to remain without an occupant until radical changes in the personnel of the office cause its reputation to be forgotten. In one department there is a hoodoo desk from which four clerks have died in the last two years, two have resigned, one has been dismissed and three have been transferred. Therefore, no one cares to occupy it now. A $1,200 clerk said several days ago, in a half-hearted way, that he would move from his present room and try it for awhile if they would promote him to $1,800. He said afterward, however, that he was merely joking. But there are other hoodoos in Washington. Some years ago a doorkeeper’s post in the war department building came under the ban and it was a source of considerable annoyance to the officials. At this particular door the first misfortune was death, the second dismissal, the third holder of the post lost his wife by death and finally fell and broke a limb, and the fourth appointee in succession lost a child and then resigned. This resignation kept the place vacant for a time, as no one could be induced to take it. The place had to be filled by calling on the civil-service commission for some one from the outside. Perhaps the most conspicuous case of a hoodoo desk in any one of the Washington executive departments was that in which a succession of misfortunes came to private secretaries of one of the assistant secretaries. Several deaths and other misfortunes made the place dreaded. With such scanty facts, usually a dead-giveaway for an urban legend, we might more plausibly attribute the deaths to intemperance, summer cholera or even overwork. Still, I was intrigued to read this little snippet about a “hoodoo desk” in the United States Senate. Senator Crawford will occupy the “hoodoo” desk, formerly held by Mr. Burkett. It is labeled with the fateful number—23—and its reputation for ill luck has always been maintained. The number 23–for reasons that are obscure and much-debated–is supposed to be unlucky. But I haven’t found out what particular form of ill-luck the Senatorial desk brought upon its distinguished sitters. Coe. I. Crawford of South Dakota served in the Senate from 1908-1914, when he lost his bid for renomination. He lived until 1944. Senator Elmer Burkett of Nebraska left the Senate 3 March 1911, but did not die until 1935. Not a very effective Death Curse, if that was the desk’s specialty.